“Thank you seems grossly inadequate…” said the mother of 2015 Mercy graduate Susie in a recent letter to Mercy’s Sacramento staff. Adopted as a baby, Susie came to Mercy last year after struggling for years to find her identity and worth in all the wrong places. Susie and I both saw the Facebook post today with news of 2 more graduates from Mercy. As these young women graduate, I can imagine that you wonder what happens to those you have poured your life into for so many months when they leave Mercy. I’m sure Susie will write to you at some point, but I just wanted to share briefly with you how she’s doing. I think we were all cautious about her returning home… for a number of reasons. However, overall, she has done quite well. In fact, I think she has even surprised herself at how well she’s adapting to life-after-Mercy, as well as being at home. She is taking foreign language classes, she has begun performing again (and seems to be enjoying it), she is tutoring teenagers, and while I was gone for a few weeks, she did a great job of taking care of the house/meals/laundry/etc. The time she spent at Mercy was truly transformative. People used to comment that her eyes seemed “dead.” Now there is a light and a simple joy to her smile and laugh. I can’t imagine where she might be if she hadn’t come to Mercy, or if she hadn’t stayed. There are things she’s still working on (as we ALL are working on things), but she is on a very different path, led by the Spirit, and using the skills she learned at Mercy. I can guess that there may be times when you wonder how God will bring healing and restoration to the hurting lives of the women you work with and that you may never see the positive results of your work in many of their lives. But…we are able to see daily the impact you each had on Susie. “Thank you” seems grossly inadequate to express our appreciation for the role you have had in Susie’s life and in our whole family. Throughout her childhood, Susie had sought love and approval through her musical performances and over-achievement. She left home to attend a university for the performing arts at age 16, but became overwhelmed and turned to partying for acceptance. Eventually Susie ended up in controlling, abusive relationships and began to self-harm to numb her pain. She struggled with depression and suicidal thoughts and was hospitalized several times. Susie’s mom presented Mercy Multiplied to Susie as an option for help, and Susie decided to apply. 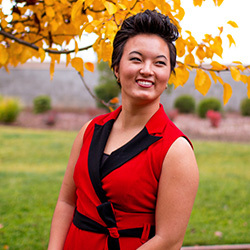 Through the Mercy program, Susie was able to break free from her life-controlling issues. Mercy celebrates with Susie’s mom God’s complete healing and transformation in her daughter’s life and His continued work through Susie to multiply hope to others, including her family, students, and concert audiences.